Something a little different this weekend, a coffee review. While I generally keep the weekend review to beauty, it felt like a Saturday afternoon was the perfect time to talk about Pact coffee. 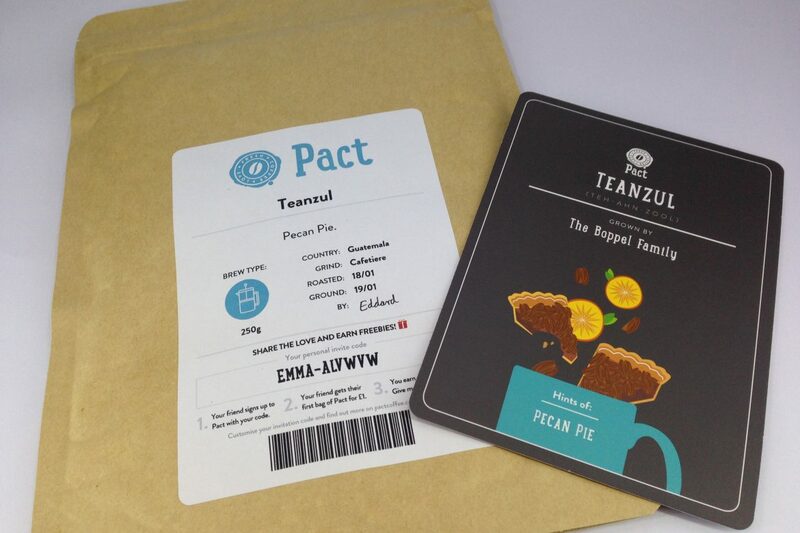 I signed up for Pact coffee back in January with the offer of my first bag for just a £1. The usual price is £6.95 and for that you get 250g of coffee, freshly ground to your liking (I have a cafetiere). The bag fits through your letterbox which means no pesky red cards (much like Graze) and you get a lovely card telling you about the coffee, where it came from and what it tastes like. It’s a nice touch. With my first bag I also received a fridge magnet with instructions on how to make the perfect cup of coffee in a cafetiere. I chose to have bags delivered once every two weeks, but you can have them delivered more often than that if you’re a big coffee drinker. You can either stick with the same coffee each time, let them pick, or go in and pick from one of the few they have an offer. They didn’t have that many to choose from though and if I had stayed subscribed any longer, that would have started to annoy me. The Decaff Planalto was the first bag I received and by far my favourite. A couple (including the Teanzul pictured above) I really wasn’t a fan of. Between having such a relatively small choice and not liking a few I was sent I decided to cancel the subscription. I like being able smell coffee in a shop and pick on that basis, rather than have someone else choose a shortlist for me. I’m glad I tried it though. Have you tried a coffee subscription before? What did you think?